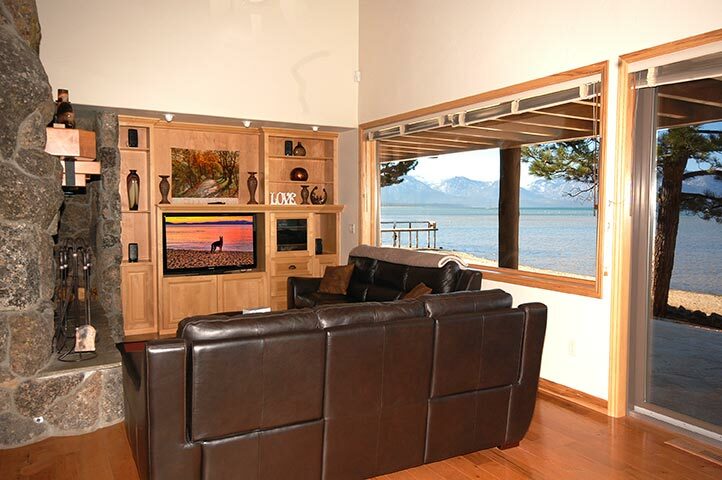 Stay of the Month - Experience the Tahoe lifestyle that most only dream about....Lakefront in a luxury home, minutes from all that Tahoe has to offer, and steps to our most beautiful asset - the Lake itself. Entering this gated community immediately provides a refreshing element of privilege bordering on the surreal. This is like having your own lodge. Flagstone patios wrap the pine log exterior instilling a classy touch for outdoor relaxation, viewing, and tanning. Steps from the front door lead directly onto the sand and one of two private beaches! 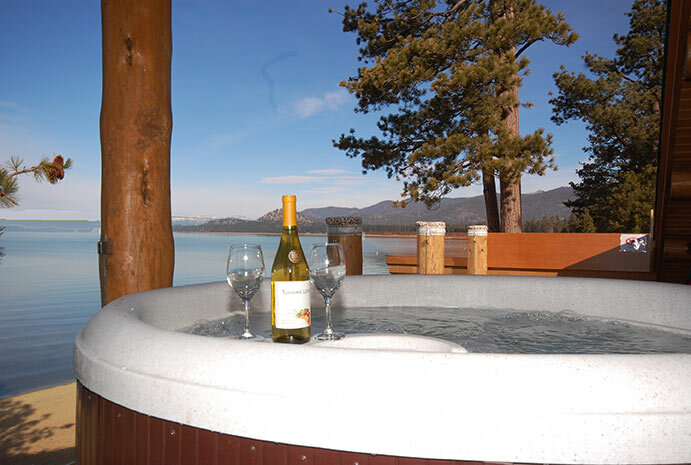 The hot tub on the upper deck is on the lake side, making it the perfect place for revitalizing or quiet reflection. Tahoe Meadows instills a luxurious sense of privacy with distinctly rural charm, right on Lake Tahoe, within easy reach of the nightlife offered by town. Listed on the National Register of Historical places, this location ranks among the most coveted in the Tahoe Basin. 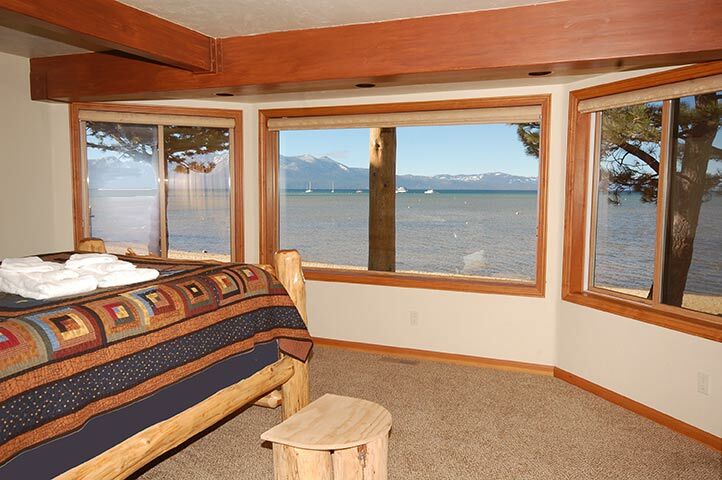 Embracing the deep blue waters of Lake Tahoe on its front, and full views of Heavenly from the other opens the mind to extreme serenity, and endless possibilities. Green space between properties, and even the placement of trees for extra privacy is all top notch. Summer months offer tether ball, ping-pong, volleyball, and even a baseball diamond so you can work up some heat before taking a cool dip in the Lake. Shuttle service (from the entry gate) to Heavenly is offered during winter - a nice plus. The Tahoe Queen is docked within an easy stroll for lake view sightseeing. For boat owners, the Community offers a pier to use for loading before heading out. Summer also opens up an on-site outdoor theater for family movies – and purportedly some hilarious talent shows - while s’mores are being roasted on the open fire. And we haven’t even gone in the place yet! Once inside, you’ll recognize this place was clearly built by a true craftsman. It exudes quality everywhere you look. Open beamed ceilings top off an intelligent floor plan that flows freely from room to room to maximize space, and of course lake views! Pine, fir and granite are tastefully accented with lodge pole décor throughout. If you love to cook, this kitchen will fuel your wildest gourmet creations. Work your magic while the open space keeps the social vibe flowing. Views from alpine bedrooms are perhaps the best way to start any day, especially after drifting off blissfully in one of the comfortable beds. Four full bathrooms are expertly decked out in tile and stone with great attention to detail. Completing the Tahoe mountain theme, the open fireplace is huge - reminiscent of gold era hotels. Cozying up to a warm fire after running the slopes or a day on the water is about as perfect as it gets. Make it real. 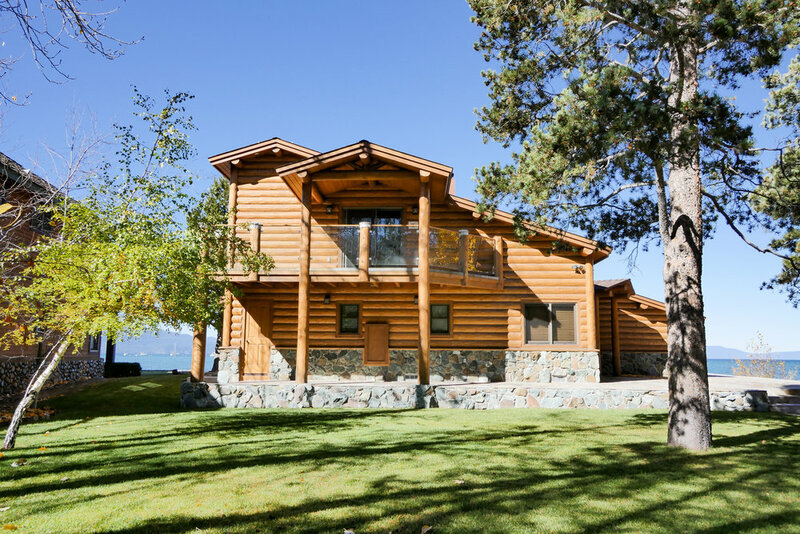 This special home boasts a mountain decor true to her Tahoe heritage. High ceilings with wood beam accents and massive windows contribute to the elegance of this home. Any cook will appreciate the state of the art kitchen, with granite counters and stainless appliances. The open floor plan features a bar area overlooking the lake. which can be used for additional seating for dining or for your own private beach front happy hour.